No, not that kind of mushroom and not that kind of experiment. I have been reading a wonderful new book, chef Chad Hyatt’s The Mushroom Hunter’s Kitchen, and it has led to compulsive kitchen experimenting. Hyatt writes about porcini, morels, and the other “premium” mushrooms, but also about more common mushrooms that you never encounter in upscale restaurants but might find a bagful of if you’re a mushroom hunter. He suggests substitutes where appropriate and encourages a lot of experimentation. He has me adding cooked ground black trumpet mushrooms to my umami sauce, and I’m especially interested by his mushroom leathers, in one case made from the Sullius mushroom genus that I no longer harvest because I dislike the texture so much. This makes the despised mushroom sound worthy of a place in the take-home basket. I happen to have a lot of lobster mushrooms in the freezer, because they are beautiful and plentiful and I can never resist harvesting them when I find them, but the unfortunate truth is that to my palate they have very little flavor at all. 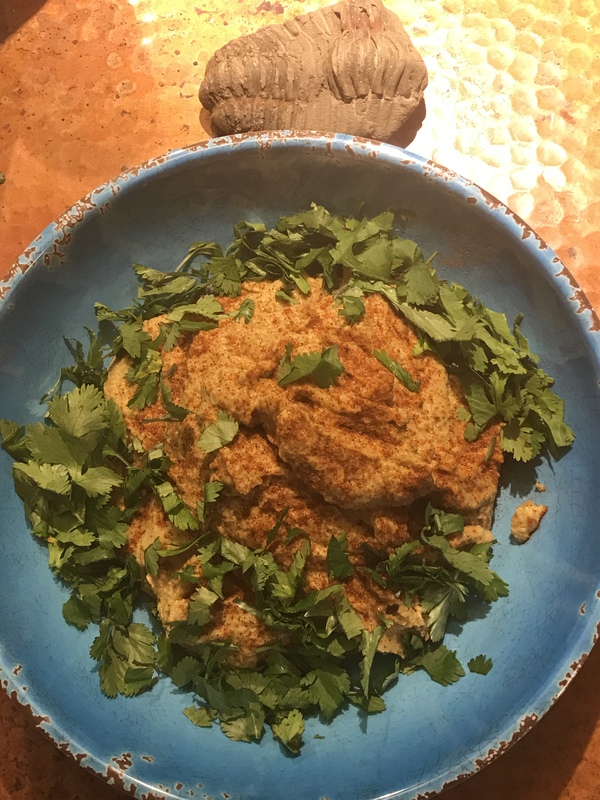 I love hummus, and as a low-carb person I can’t eat it often, so I was interested by Hyatt’s recipe for hummus made from salted mushrooms. I don’t have any salted mushrooms at hand currently, but I certainly do have lobsters. They were sautéed in olive oil before freezing, and I decided to thaw a bag and try a recipe based on Hyatt’s. The lobsters went in the food processor, about 2 cups of them, with 1/4 cup of tahini, the juice of two small lemons, two cloves of raw garlic, and some additional olive oil. After a few minutes of processing and adding salt to taste, the taste was good but the texture and mouth feel were not at all what I wanted. I moved the somewhat grainy lumpy mixture out of the processor and into my Vitamix blender, added more olive oil so that the mixture would blend, and blended it on the high setting, stirring the contents down a couple of times. The texture was now exactly what I wanted, not totally smooth like baby food but with a texture much like chickpea hummus. 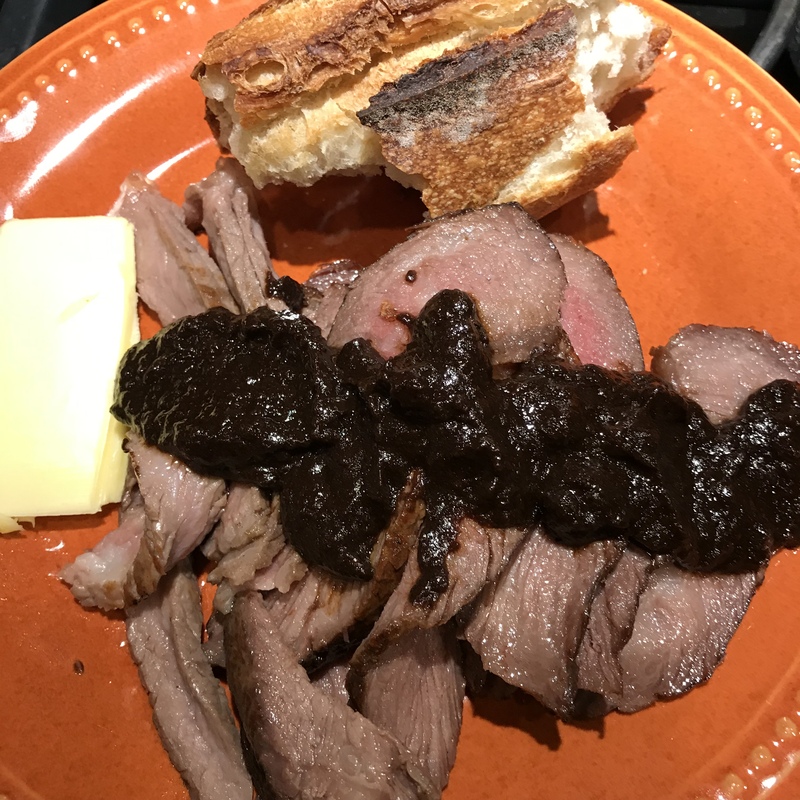 Dolloped into a bowl, sprinkled with ground chipotle chilies rather than the more traditional sumac, and garnished with chopped cilantro, it made a delicious spread. I should add that Hyatt calls for less olive oil than I ended up using, although I didn’t measure precisely. I love the taste of top quality olive oil and lobster mushrooms have little natural flavor of their own, so for me this was a natural adjustment to make. This first very successful experiment has me reading the book with renewed interest. It can be rather painful to read mushroom books out of season, when there is no way to go out and find the mushrooms, but most of us who hunt mushrooms have a lot of frozen or dried mushrooms from past successful hunts, and this can help us get busy and get them out of the pantry or freezer. Also, specialty grocery stores have much larger selections than they used to. The last time I was in Whole Foods, I counted seven varieties of fresh mushrooms. Buying those hideously expensive little packets of dried mushrooms from the grocery store is not really an option if you want mushrooms in bulk, but you can buy bulk dried mushrooms from several sources. I usually use Oregon Mushrooms or buy from private foragers when I want to augment my pantry supply. By the way, know your forager. Not every forager should be trusted blindly. 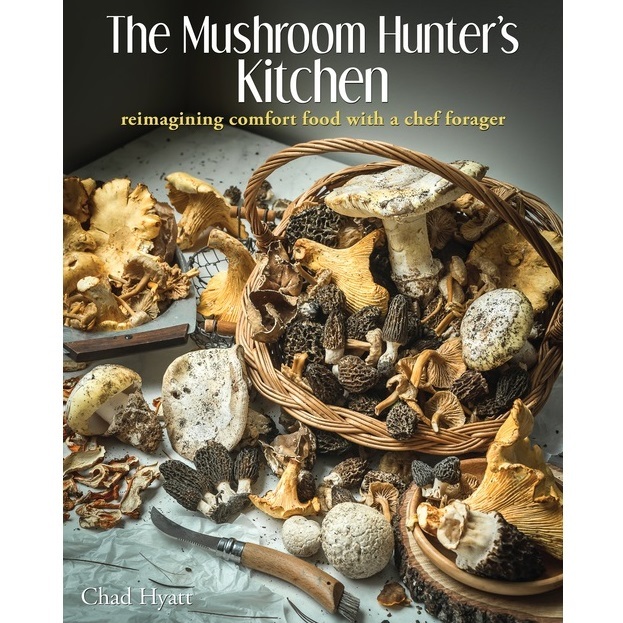 In short, if you like to eat mushrooms at all, I highly recommend Hyatt’s book, whether or not you are a mushroom hunter. His creativity is wonderful. For example, there is an entire chapter of mushroom desserts. 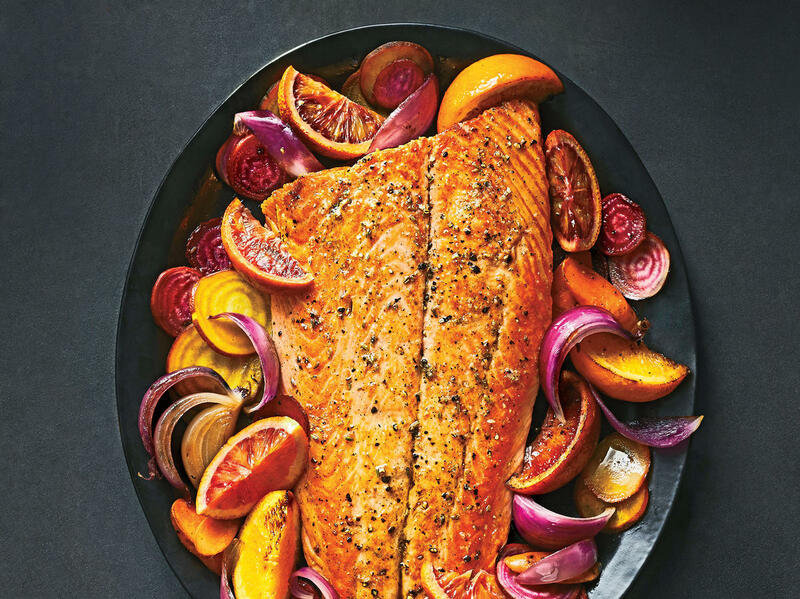 This is not a category of possibilities that I ever gave the faintest thought to, but the recipes look really good and seem designed to get cooks thinking. And this, to me, is the hallmark of a really successful cookbook. A good cookbook may give me a few recipes that I use verbatim, but it’s more important that it gets me excited about the endless vagaries of food and leaves me feeling that there are more possibilities than I’ve considered. Lifting simple nourishment and avoidance of starvation to an art form is what cooks do, and a good cookbook can get us very jazzed about doing it. Keep in mind that the book has some very useful notes about lesser-known edibles but is a cookbook, not a foraging book. You will still need a field guide (and some good teachers) if you’re new to the sport. Hyatt is selling his book directly, in both hard copy and ebook format, at the link above. As always, I don’t accept review copies. Books that I review are bought at the price that you will pay. This one is worth every penny. Any regular reader of my blog knows my nutritional obsession: nobody really eats enough leafy greens, including me. But I do make regular efforts to correct this. In my last post I wrote about grassfed short ribs red-cooked in Chinese fashion, and tonight I wanted that soft succulent meat again but with a strong vegetable component, not the pure meatfest that I had last time. I am also conducting an ongoing experiment to see what greens can produce in winter in my garden with no protection. This sounds simple, given that I am down in zone seven and vegetables like kale are famous for holding all winter up in zones four and five, but it’s a little more complicated than that. Our desert winters are not as cold as further north, but they are absolutely dry with no protective snow cover and have occasional windstorms that will wipe the moisture out of almost anything but a cactus. Kale is invariably withered by early December. 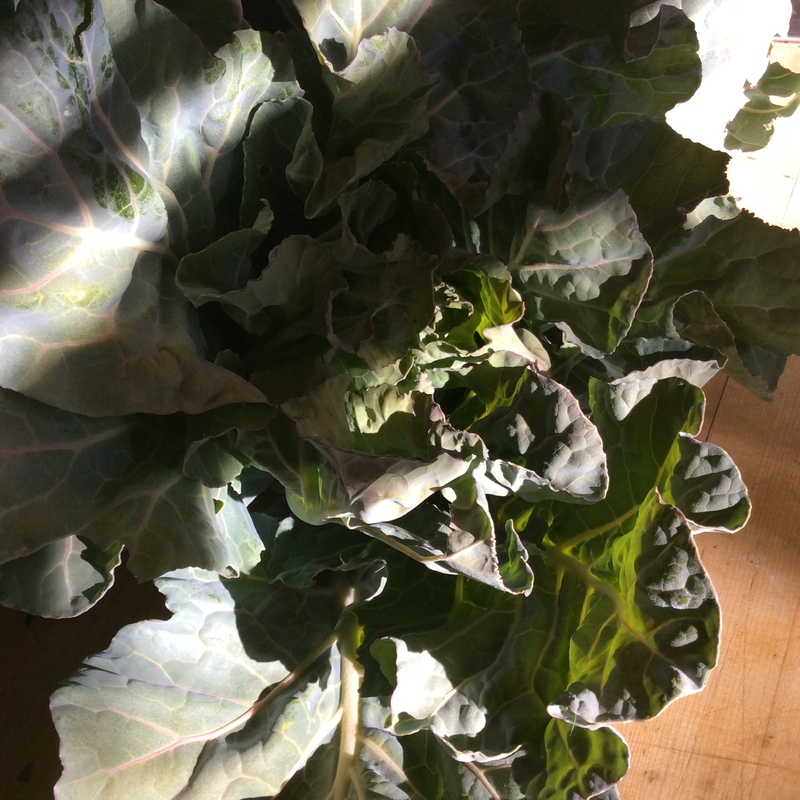 I have been trying to breed my own desert-hardy greens but have learned this year that collards, the common green of my southern Louisiana childhood, are remarkably cold-tolerant and resist drying out better than anything else. I picked the last plant today, and the lower leaves are a little desiccated but the whole upper half of the plant is still in excellent condition. I still had a cup of Master Sauce left over from cooking the short ribs. This is not the very concentrated sauce that was used to finish the ribs, but the original cooking liquid. 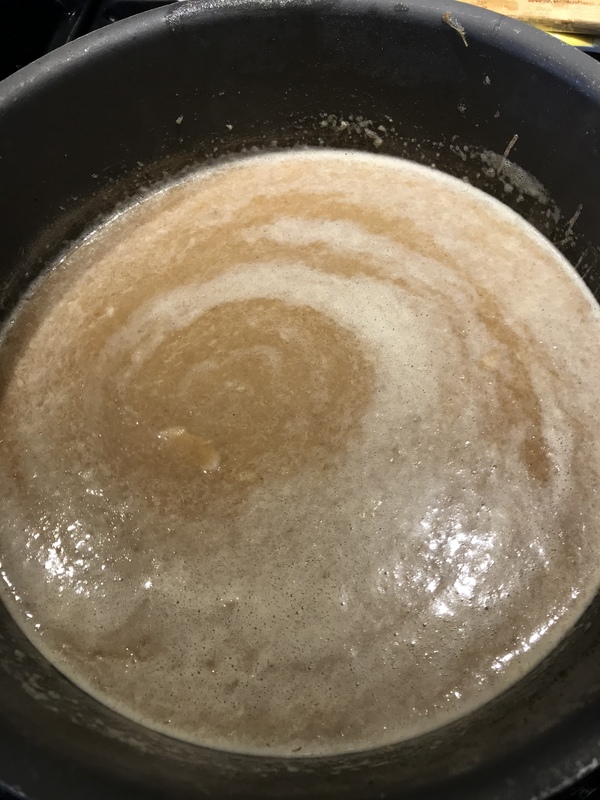 If you don’t have any Master Sauce, combine a cup of water or preferably good broth, a full “star” of star anise, a teaspoon of five-spice powder, a smashed cloves of garlic, a tablespoon of sugar or the equivalent in artificial sweetener of your choice, and a few “coin” slices of fresh ginger. Bring to a boil in your smallest saucepan, simmer 15 minutes, remove the solid star anise and garlic and ginger, and use. 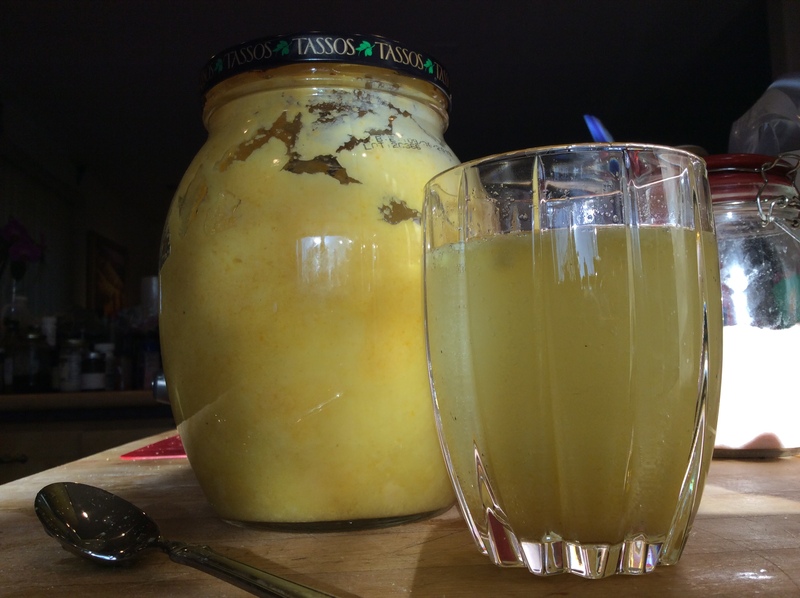 If you have a cup of this juice in a jar in your refrigerator, you are ready to red-cook veggies at any time. Just use within a week. 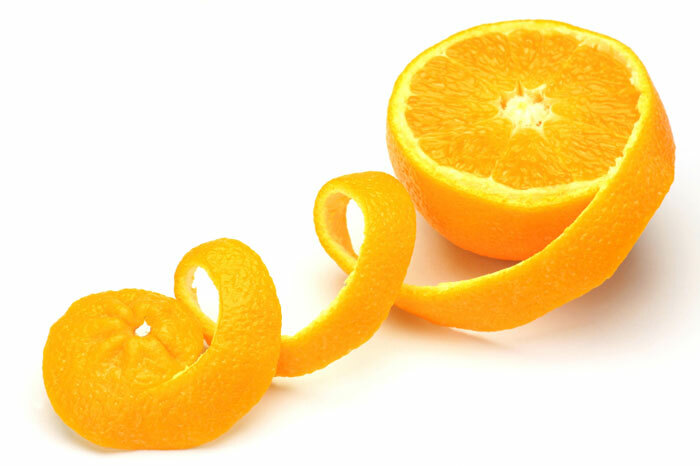 You may like it a little more or less sweet. Suit yourself. All I did with the collards was wash them, remove the tough center ribs, slice them about a quarter inch wide, bring the master sauce to a boil, and drop the leaves in. I would estimate that there were 8 to 10 whole leaves and maybe about 2 quarts very loosely packed when they were sliced up. This would be the equivalent of one bunch of supermarket collard greens. I cooked over medium-high heat for a bit over fifteen minutes, stirring very frequently toward the end, until the greens were fairly soft and the liquid almost gone. At this point they are dark and very intensely flavored and delicious. 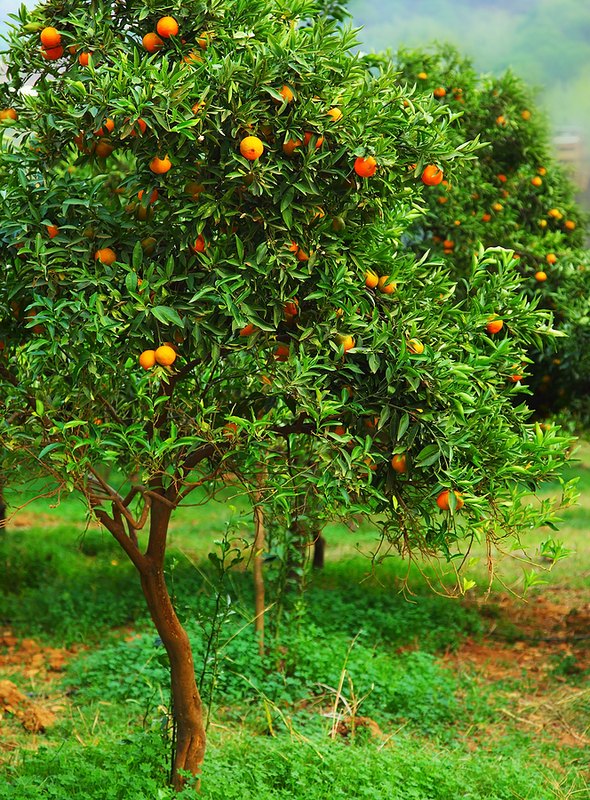 If you want them a brighter color but a little less flavorful, you can stop at the stage above, before the greens start to darken, but be aware that they are definitely somewhat tougher at this bright green stage. 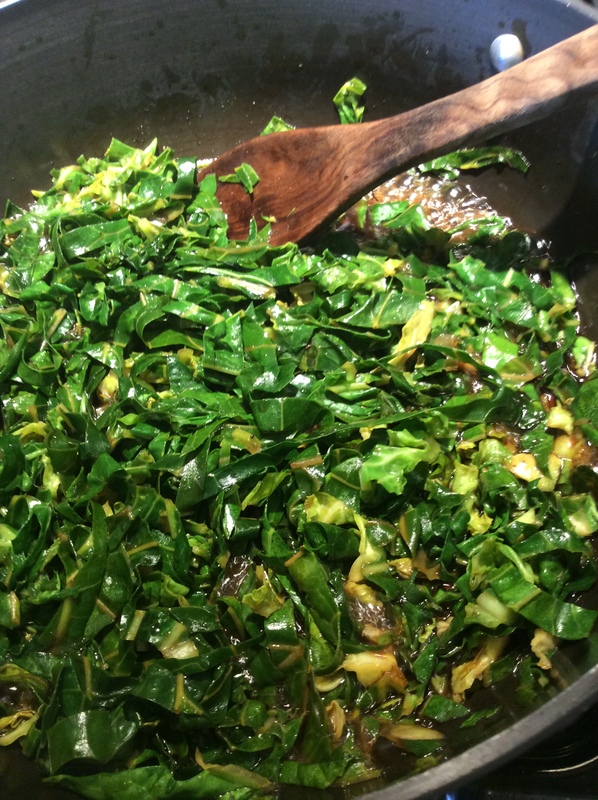 Some people like the extra chewiness, but most do not, and often your thick-leaved winter greens will be better accepted by others if they are cooked a little more. In fact, as I keep saying, this is true of greens in general. Cook them until they taste good, and don’t stop sooner. 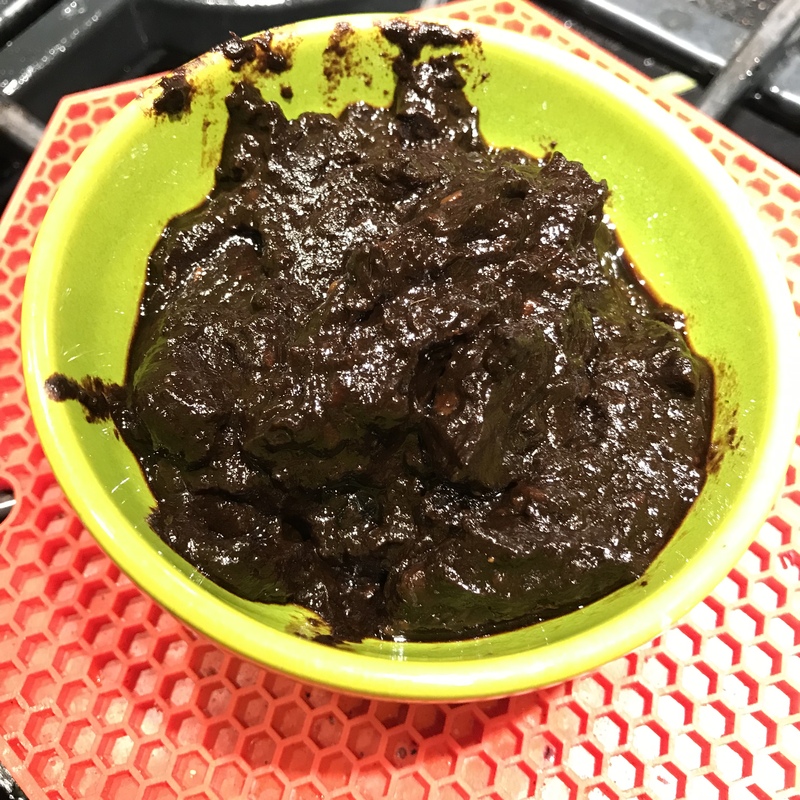 As long as you are using the cooking liquid, or in this case evaporating away most of it, there is little nutrient loss, and the greens will taste better so that you eat more of them, and also will probably suit your GI tract better. In the picture below, you can see the finished dark greens underneath the short rib meat. What you can’t see is that there is quite a pile of them, and really only several bites of meat. Add ginger and green onion relish, or not, as you choose. But the greens are serving as the bulk of the meal, and you avoid any use of starches, and you will be full for hours and hours afterwards because of all the soluble fiber in the greens. I added a couple of roasted carrot slices for more color, and of course for flavor. Incidentally, if any greens are left over, they are delicious the next day and can be just brought to room temperature and eaten as a sort of cooked salad. Nettles are one of my favorite greens, and one of the most nutritious plants around, so treating them with the respect and care that helps you avoid stings is definitely worth the trouble. 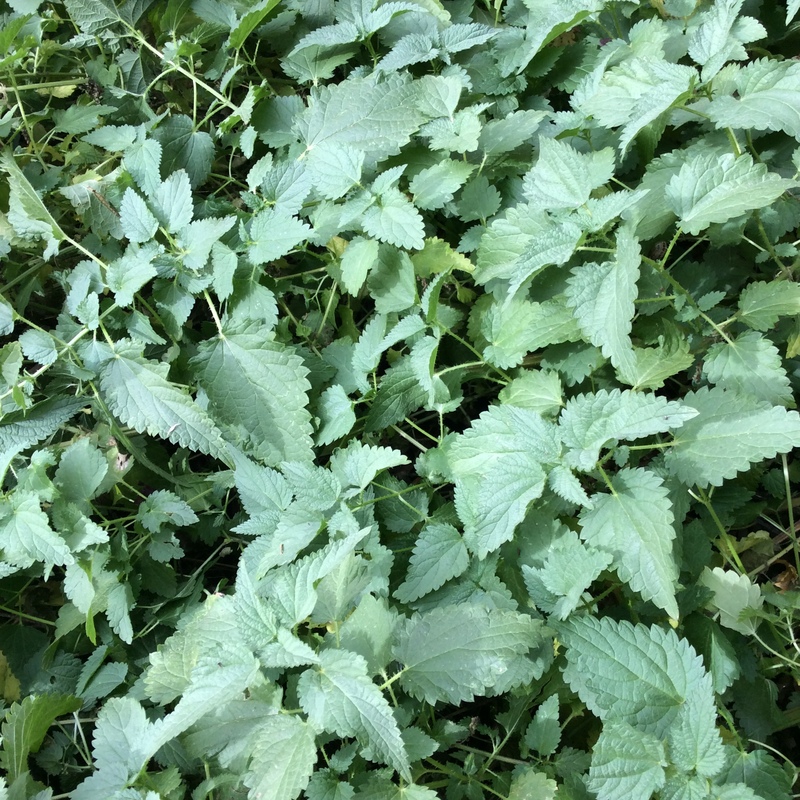 I have a thriving nettle patch in a corner of my yard that I don’t routinely have to visit, so I have always harvested the new greens in the spring and then assiduously ignored the nettle patch for the rest of the year. 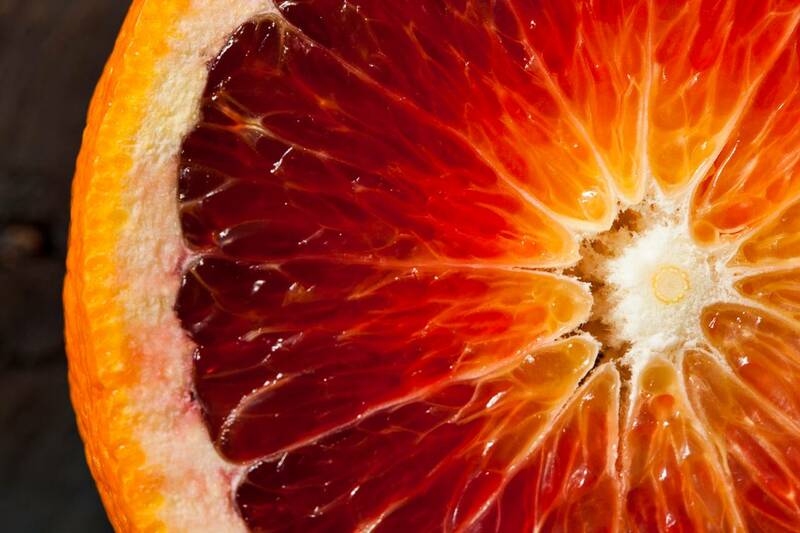 This is partly because I get interested in other things, but mostly because as a child, when I first started foraging to the intense dismay of my parents, my mother wisely bought me a set of Euell Gibbons books so that I would not poison myself. Mr. Gibbons wrote eulogistically about nettles, but cautioned his readers that after the spring flush they develop oxalate crystals and are gritty and inedible. I believed every word he wrote, and so I never tried them after they were about a foot high. Here in the desert, in the unwatered spot where they have to live in my yard, nettles die back beginning in July, and the stems look dead by September. But this year we got an uncharacteristic long heavy rainstorm in late September, and to my surprise the dead nettle stems began to leaf out again. This week I noticed a mat of fresh nettle leaves, and told myself that no doubt they would be gritty, exactly as Euell had predicted. But I did gather a couple of quarts (using leather gloves) of nettle sprigs and tried cooking them. 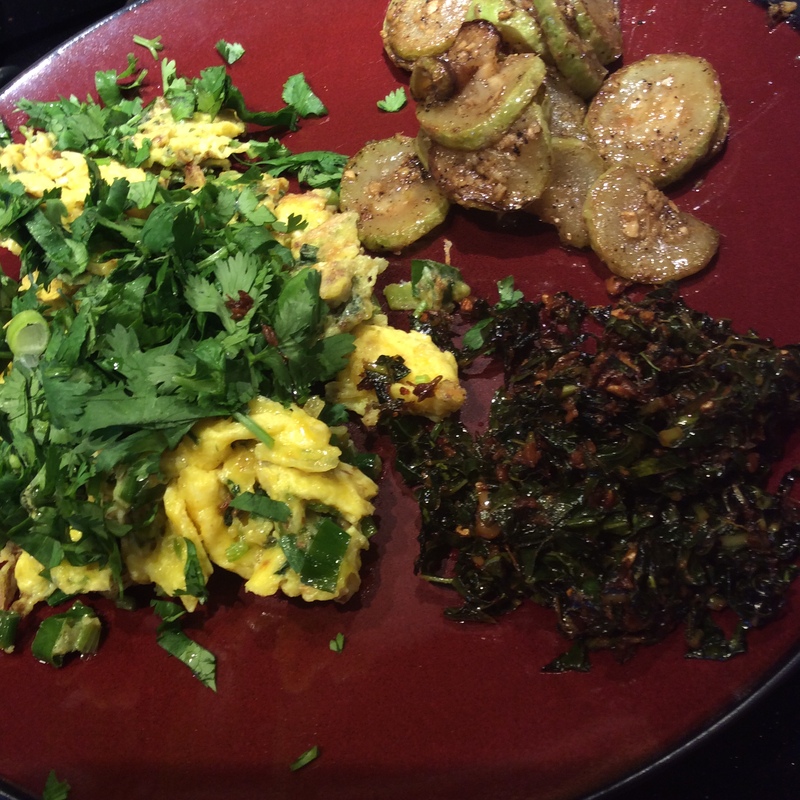 They were exactly as verdant tasting as the spring greens, and neither gritty nor tough. Now that I know this, I will try to remember to cut my nettle patch back when it dies in the hottest late summer weather, and begin to water in September so that the late fall shoots will be easier to pick. 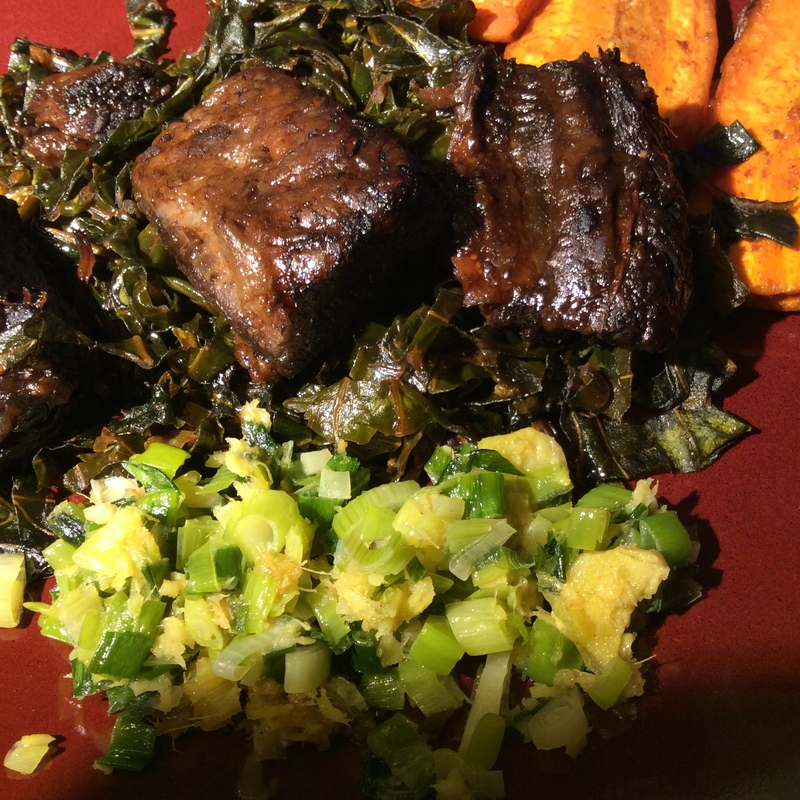 Cooked greens in the refrigerator are an appetizing snack or light meal waiting to happen. Today I didn’t particularly feel like eating a heavy lunch, but I did want something, and I wanted it to be healthy. I had a cup of blanched nettle greens hanging out in the refrigerator, and half a cup or so of leftover cooked cauliflower rice, so I grabbed two large scallions out of the walking onion patch and picked three large carrot leaves off the last remaining carrots. 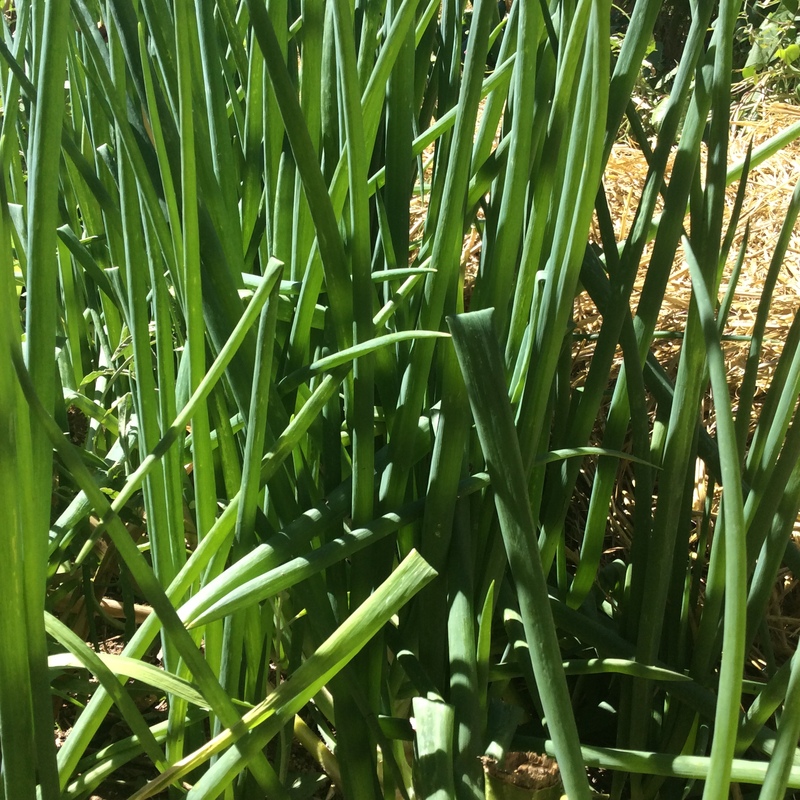 The garlic that I planted in late summer is sprouting, so I picked one stalk that was about 6 inches high to use as green garlic. The fresh green stuff was chopped and sautéed in butter until cooked through, then the cooked nettles and cooked cauliflower rice were added along with about 2 cups of canned chicken broth and half a cup of heavy cream. You could certainly leave this as a chunky soup, but I decided that I wanted a cream soup, and put the little potful in my Vitamix blender. About a minute later, it was completely creamy and thickened. I poured it back in the cooking pan, added a little water to thin it to a good consistency, simmered for 10 minutes, salted to taste, and ate it with a spoon full of drained yogurt on top to supply a subtle acidic element. The entire process, including grabbing the green stuff from the yard, took about 15 minutes. This is a pretty small time investment for something as absurdly healthy as nettle soup. Needless to say, vary to suit your own taste. Cooked cauliflower is a surprisingly good creamy thickening agent, and if you are vegan you could use olive oil for the initial sauté and vegetable broth for the cooking liquid, and leave the cream out or substitute nut milk. It could be finished with a few drops of lemon juice instead of drained yogurt. Vegetarians can change the broth and leave everything else the same. As written it is a delicately flavored and very comforting soup, perfect for days when fate is being unkind, but if you want something more emphatic you can start playing with herbs. If you don’t happen to have a nettle patch, use some other leafy green. Have fun in your kitchen and make the result work for you. 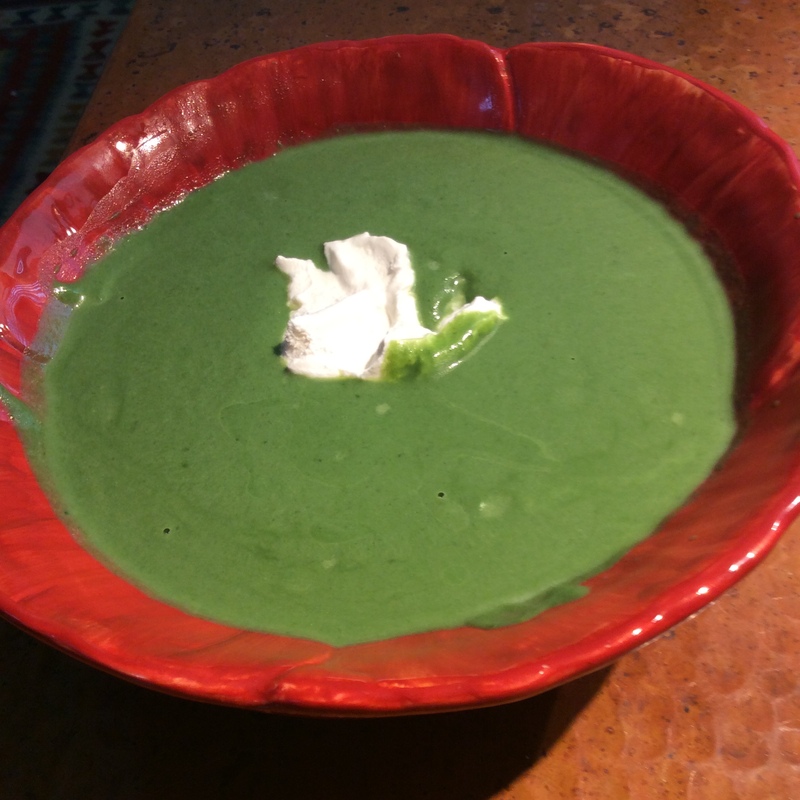 My mother objects to my greens soups on the undeniable grounds that they are green, but if you have a prejudice against the color green in food I do hope that you will get over it, because it is the marker for some of the healthiest food that you can possibly eat. And by the way, Euell Gibbons wasn’t right about everything, but his foraging books are still well worth reading for their palpable joy in the outdoors. In one plant essay he says that wild foods are his way of taking communion with nature and the Author of nature, and I think this sums it up.